Allergy Advice: Contains Wheat, Milk, Egg, Soybean. May also contain oat, sesame, peanut, almond. Ingredients: Crust: Wheat Flour (26.67%), Anhydrous Milk Fat, Sugar, Egg, Palm Oil (Contains Soybean), Milk Powder, Emulsifier (E471), Raising Agents (E450(i), E500(ii)), Salt, Flavouring. Filling: Glucose Syrup, White Gourd Filling (White Gourd, Maltose, Sugar), Strawberry Powder (0.5%), Condensed Apple Juice, Maltodextrin, Corn Oil, Soybean Fibre Powder, Konjac Flour, Humectants (E422, E420(ii)), Acidity Regulator (E330), Preservative (E202), Flavouring (Contains Milk). 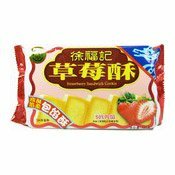 Simply enter your details below and we will send you an e-mail when “Sandwich Cookie (Strawberry) (徐福記草莓酥)” is back in stock!